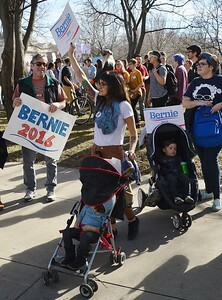 Bernie Sanders supporters gathered at Cheesman park in downtown Denver Colorado and marched to the State Capitolto support Sanders candidacy for the Democratic patty's nomination fo President. 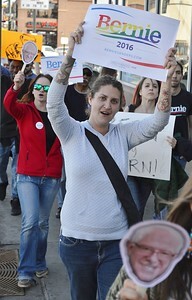 Woman raises "rainbow" Bernie 2016 sign, woman next to her also raises signs, other in the background with signs. 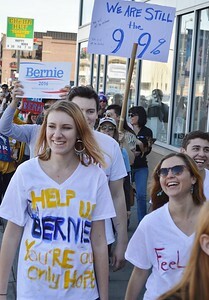 Young woman holding Bernie Sanders cutout, others with signs marching behind her. 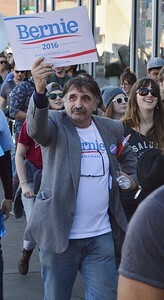 Man wearing sportcoat and glasses around neck holds up Bernie 2016 sign, other Bernie Sanders suppoorters marching behind him. 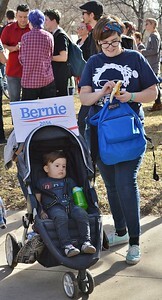 Young mother holds sign abovbe head with Bernie Sanders quote on it, child in stroller next to her looks at cell phone. Other woman and child in background. 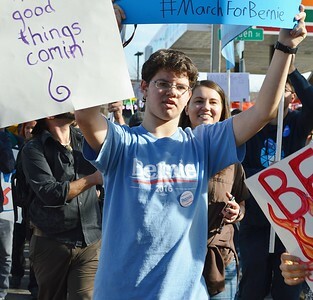 Young man wearing Bernie 2016 shirt raising sign above his head. other marchers behind him. 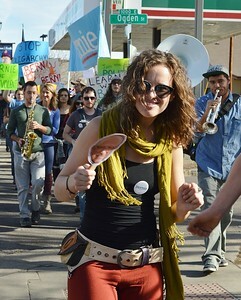 Young woman holding Bernie Sanders sign, other marchers, including musicians and people with signs and banners behind her. 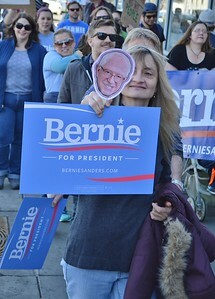 Woman at March For Bernie holding cutout of Bernie Sanders and sign. 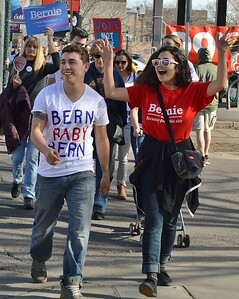 Young man wearing "Bern Baby Bern" shirt along side woman shouting and raising hands in air, other with signs behind them. 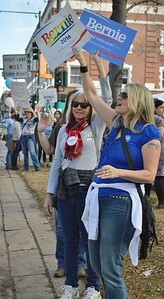 Young woman raising American flag in the air while flashing peace sign, large group in background waving Bernie Sanders signs. 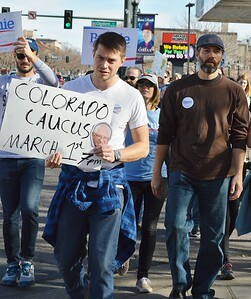 Man with Colorado Caucus sign in March For Bernie. 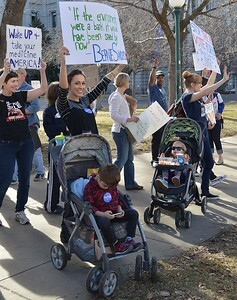 Mother and child with Bernie Sanders signs, others marching behind them. 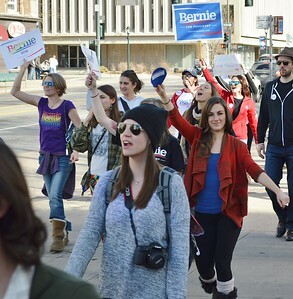 Young woman at March For Bernie shouts and raises hands in the air, other marchers behind her. 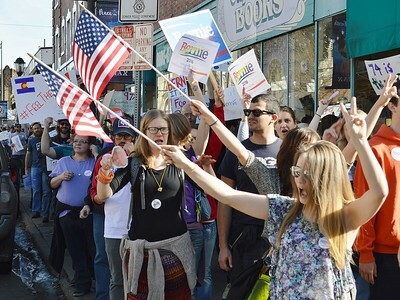 Woman raises Bernie 2016 "Rainbow" sign above her head, others at March for Bernie behind her. 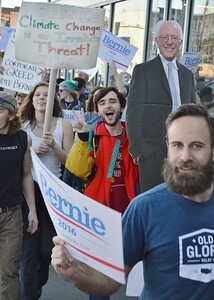 Marchers with signs next to large cardboard cutout of Bernie Sanders including young man flashing peace sign. 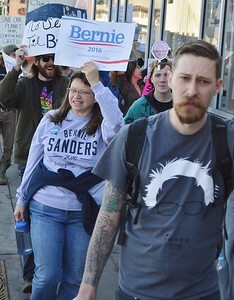 March for Bernie participants, including man and woman wearing Bernie Sanders t-shirts. 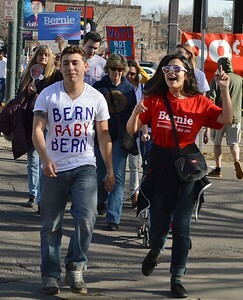 Two young women wearing painted t-shirts at March for Bernie, others with signs behind them. 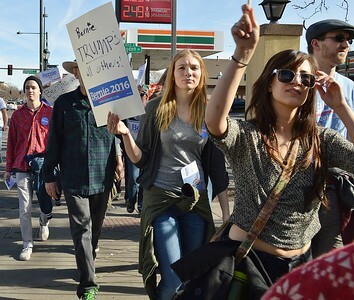 Young woman holding "Bernie Trumps All Others" sign, other marchers around her. Bernie Sanders supporters with signs marching, some shouting. 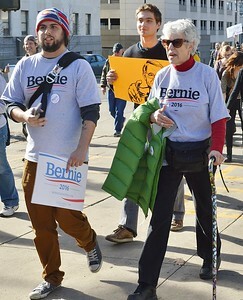 Woman wearing Bernie Sanders t-shirt, walking with cane, man next to her wearing same shirt. 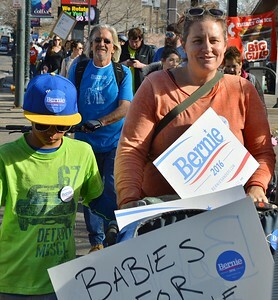 Young mothers with children in strollers, at March For Bernie, holding signs. Mother peeling banana, child in stroller with Bernie Sanders sign on it, next to her. 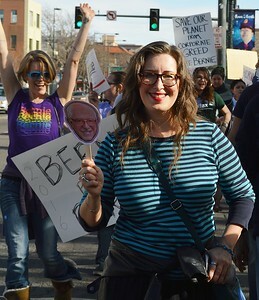 Two woman holding up signs supporting Bernie Sanders. 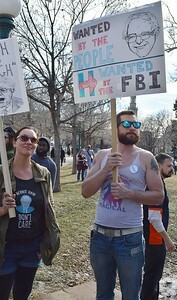 Man holding sign about Hillary Clinton and the FBI. 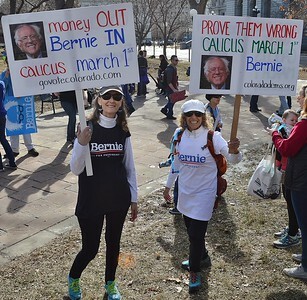 Two women wearing Bernie Sanders t-shirts hold up signs about Colorado Precinct Caucus. 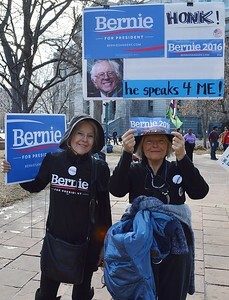 Two women holding signs at March for Bernie.